A new type of automatic transmission enables coaches to slice their way through demanding mountain roads comfortably and efficiently. Svenja Karl has been online editor at ZF since 2013. The graduate industrial engineer specializes in topics relating to the Group's products and technologies. The mountain pass snakes its way up the mountain, to almost 200 meters in altitude. Twelve steep kilometers with seven hairpin bends lead voyagers to Scheidegg in the Allgäu. This is a demanding route which can be really tough on the driver, especially when they're at the wheel of a 13-meter-long coach. 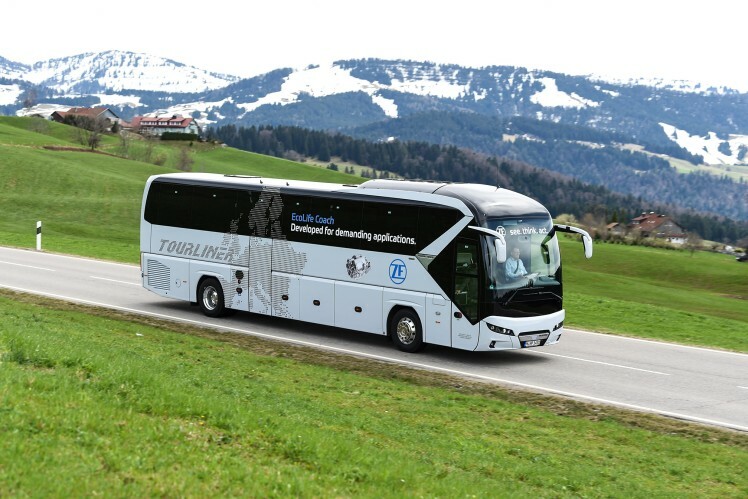 However, if the coach is fitted out with the ZF-EcoLife Coach automatic transmission, like the Neoplan Tourliner, even routes with a demanding topography become a breeze for coach drivers to traverse. In mountainous regions, coaches often have to brake hard due to frequent narrow bends and then have to accelerate strongly again. This means that many gear changes have to take place in a short space of time. This is the case for the serpentine roads in the South German Allgäu. The ZF-EcoLife Coach automatic transmission really shows off what it can do here. Its high energy conversion efficiency, coupled with its gentle yet efficient acceleration without tractive force interruption when shifting gear, enable the coach to glide up the breakneck curves calmly and evenly. Speed and accelerative force are not reduced here, which has a positive effect on both fuel consumption and noise emission. These transmission features translate into the highest levels of comfort, not only for the coach driver but also, more importantly, for the passengers. 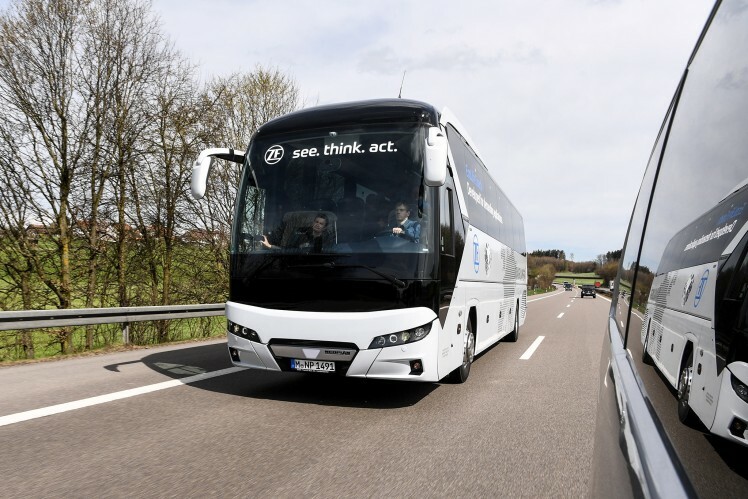 A bus equipped with a ZF-EcoLife Coach is easy to maneuver and enables the driver to go very slowly without wearing out the clutch. The high-performance torque converter in the ZF-EcoLife Coach 2,300 Newton meters. ZF-EcoLife has already established itself as the worldwide benchmark for buses in city traffic. Now, ZF has expanded this transmission family to include transmissions for coaches and intercity buses. In addition to the advantages that ZF-EcoLife Coach displays on mountainous routes, it also serves the current trend, namely that many coaches often drive in cities for long periods, particularly when they are used as shuttles between city hotels and the airport or for sightseeing tours at the destination. In both cases, the coaches and their transmissions have to tackle both low speeds and frequent gear changes in stop-and-go traffic. The ZF-EcoLife Coach provides an optimal combination, uniting the requirements of coaches with the driving environment of city buses. The high-performance torque converter in the ZF-EcoLife Coach transmits engine torques of up to 2,300 Newton meters, thus endowing the coach engine with a comparably high power output. 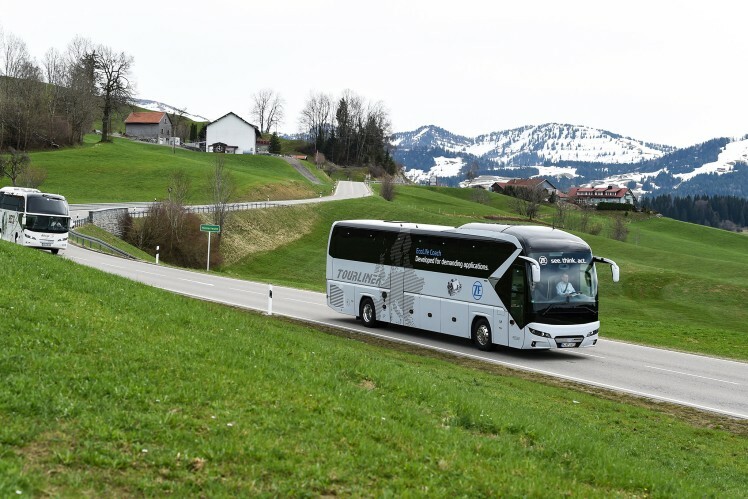 The ZF-EcoLife Coach scores highly in mountainous regions, with its high level of energy conversion efficiency and its soft, efficient acceleration without tractive force interruption when shifting gears. When driving downhill, the ZF primary retarder deploys its braking effect in relation to the engine speed, which boosts safety and protects the service brake. 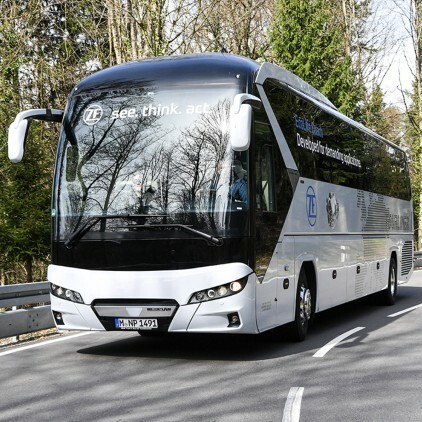 ZF-EcoLife Coach has been in volume production since fall 2016. 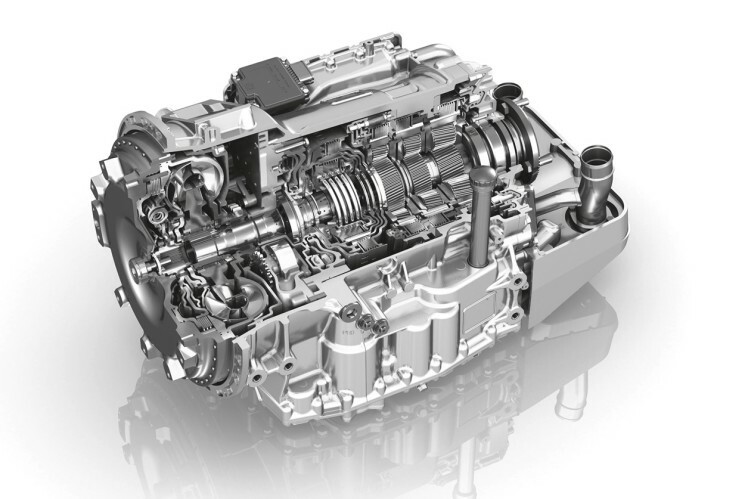 MAN equipped its Neoplan Tourliner with this transmission, to give one example.